For the fourth headlining showcase at Decibel Festival, the night was to pay tribute to twenty five years of Detroit Techno. Widely considered the first American underground electronic scene, it launched countless others and couldn’t be overlooked. It featured three prominent figures from three different waves, with Kevin Saunderson representing the first and Carl Craig and Monty Luke representing the second and third waves of the scene. Both Saunderson and Craig were preceded by their reputations but they were well earned with the role they played in shaping the future of electronic music that followed them and more immediately, for how they kept the party continuing well into the night this last Saturday. Saunderson is part of the revered Belleville Three, a small group of African American techno DJs from just outside of Detroit that were instrumental in their scene’s formation. Juan Atkins and Derrick May complete the trifecta. As Simon Reynolds wrote in his thorough study of electronic music, Generation Ecstasy: Into the World of Techno and Rave Culture, “Although the music they were into was all dance floor oriented, the “Belleville Three”...brought an art-rock seriousness to bear on what rock fans then dissed as mere ‘disco.’” He later notes that “Kevin Saunderson was the most disco-influenced of the Belleville Three.” The sound was shaped by the musical robotics of Kraftwerk and Detroit’s then booming auto industry, so when Saunderson was on the stage, his set was dominated by one thumping, steady drum beat for most of his 90 minutes. 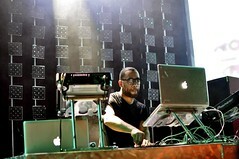 Carl Craig, a protege of Derrick May, took the stage at midnight under a cloud of heavy, red smoke. It took quite a while for it to clear and to be able to see him from the crowd. 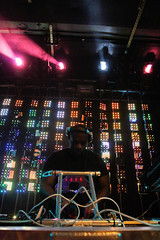 He continued for a bit with the beat from the transition from Saunderson, which went seamlessly. As Reynolds wrote of Craig, he said, “The guru of softcore, Craig’s tracks generally elevate atmospherics over energy. His rhythms are relentlessly, restlessly intelligent, but make your brain itch rather than your feet twitch.” I did spend a lot of time thinking in awe of how he put his beats together while he was playing, but thought that the packed floor of Neumos still found the space and desire to dance. He kept the party going through the time he finally had to leave shortly after 1:30 am. Before the D-25 showcase, I caught one act in the Alga-Rhythms’ FWD Thinking Organisms showcase: Portland DJ The Perfect Cyn. She played one of my favorite sets of the weekend. It was dance-oriented with plenty of pop songs (none of which I recognized and were hardly top 40 but had overt hooks) that she was able to focus and accentuate the hook to get the small crowd at Sole Repair to move. It was a smaller space but one that gave the crowd enough room to dance.